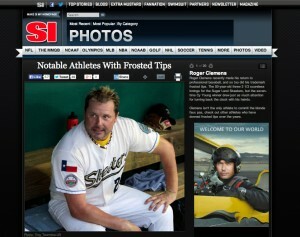 On August 25, 2012, Roger Clemens made a mini-comeback to baseball by pitching for the Sugar Land Skeeters, an independent minor league baseball team. It was a media circus for this game amid speculation that Roger was going to attempt a comeback to Major League Baseball. (Oh yeah, this game took place just two months after the conclusion of Roger’s criminal perjury trial where he was acquitted of charges he lied to Congress about taking performance-enhancing substances). The small minor league stadium was not setup for all the increased media and didn’t have much space- so they allowed photographers to shoot from inside the dugouts. 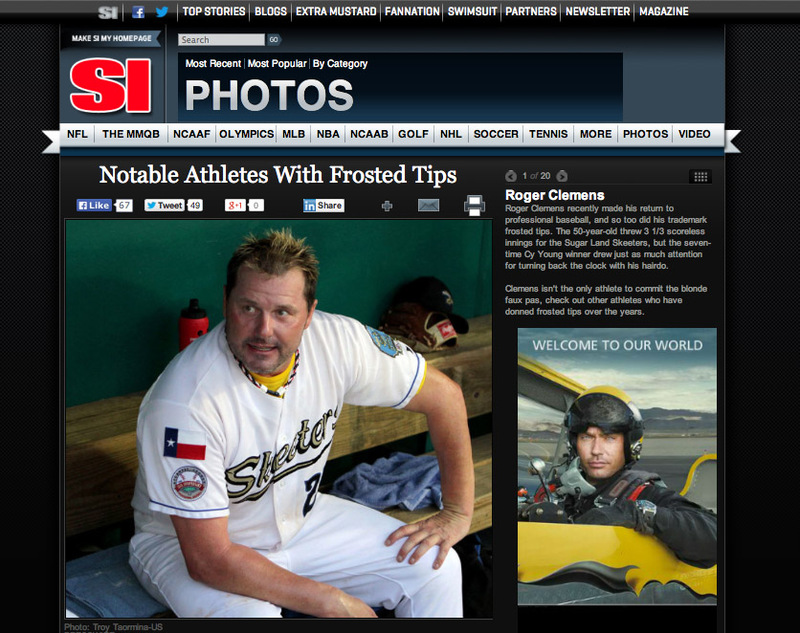 I was able to get a pretty good shot of Clemens after he was finished pitching for the night, and SI.com (Sports Illustrated) used this picture in a story on athletes with frosted tips in their hair. The caption is not very flattering, but hey- I have no control over where or how my images are used by clients. The next month, Clemens decided to pitch one more game for the Skeeters- only this time he specifically requested there be no photographers in his team’s dugout. I don’t know why he would make such a request- maybe he was sporting a mullet that night and wanted to avoid ESPN’s story on famous athletes with mullets.